Cashless trading based on credit clearing is moving into its next stage of development, the optimization and scale-up stage. Established groups and associations are beginning to recognize the importance and urgency of disengaging from conventional structures of money and banking, reclaiming “the credit commons,” and reorganizing the exchange of value under local community control. One such association is Green America, formerly known as Coop America, which has recently established The Green America Exchange as a way of offering cashless trading opportunities to members of their Green Business Network. GAEx uses the GETS trading platform which has been developed by Richard Logie, a long-time commercial trade exchange operator and leader in the industry. While the GETS software is proprietary, it seems to have the functionality needed for cashless trading within the exchange. According to Logie, the platform also has the capability needed for networking similar exchanges together into a larger more widespread trading community. In response to a request from the Green America administration I’ve written the following article for posting (in four parts) on the Green America Exchange blog. For your convenience, I’ve also posted it below.–t.h.g. Most small and medium sized businesses (SMEs) these days are having a hard time financially–sales are down, costs are up, and bank credit is unavailable, all of which is symptomatic of the stagflation that besets the American economy. Our present predicament is no accident of nature, nor is it a temporary condition; it is the expected result of a flawed system of money, banking and finance. We have allowed the banks to control our credit and charge us interest for the “privilege” of accessing some of it as bank “loans.” The fact is that the dollar regime, like every other political currency, collectivizes credit. It is the people’s collective credit that supports each national currency, but the allocation of that credit is determined by forces beyond popular control, and an inordinate proportion of it is used to fund the war machine and to enrich corporate fat cats, all to the detriment of peace, equity, and the common good. But we need not be victims of a system that is so obviously failing us. We can learn to play a different game. It is possible to organize an entirely new structure of money, banking, and finance, one that is interest-free, decentralized, and controlled, not by banks or central governments, but by businesses and individuals that associate and organize themselves into cashless trading networks. This is a way to reclaim “the credit commons” from monopoly control and create healthy community economies that can enhance the quality of life for all. In brief, any group of traders can organize to allocate their own collective credit amongst themselves, interest-free. This is merely an extension of the common business practice of selling on open account—“I’ll ship you the goods now and you can pay me later,” except it is organized, not on a bilateral basis, but within a community of many buyers and sellers. Done on a large enough scale that includes a sufficiently broad range of goods and services, such systems can avoid the dysfunctions inherent in conventional money and banking and open the way to more harmonious and mutually beneficial trading relationships that enable the emergence of sustainable economies and promote the common good—a true economic democracy. Perhaps the best example of a credit clearing exchange that has been successful over a long period of time is the WIR Economic Circle Cooperative. Founded in Switzerland as a self-help organization in the midst of the Great Depression (1934), WIR provided a means for its members to continue to buy and sell to one another despite a shortage of Swiss francs in circulation. Over the past three quarters of a century, in good times and bad, WIR (now known as the WIR Bank) has continued to thrive. Its more than 60,000 members throughout Switzerland trade about $2 billion worth of goods and services annually. Now the Green Business Network of Green America, is offering that kind of opportunity to its membership through Green America Exchange, GAEx. While still in the formative stages, Green America Exchange has the potential to become, not merely a lifeboat for SMEs in difficult times, but a model for a new paradigm in business. The challenge for any network, of course, is to achieve sufficient scale to make it useful. The bigger the network, the more opportunities it provides for cashless trades to be made. In the early stages, it may require some help to find those opportunities, but as the members discover each other and become aware of what each has to offer, the value proposition becomes ever more evident and more businesses are attracted to it. Like Facebook, Twitter, My Space and other networks that are purely social, cashless trading networks will eventually grow exponentially –and that will mark a revolutionary shift in political as well as economic empowerment. It will be a quiet and peaceful revolution brought on, not by street demonstrations or by petitioning politicians who serve different masters, but by working together to use the power that is already ours—to apply the resources we have to support each other’s productivity and to give credit where credit is due. Less need for scarce dollars. What will it take to make mutual credit clearing networks go viral the way social networks have? That is the key question, the answer to which has heretofore remained elusive. While the WIR has been an obvious success, it seems to have been intentionally constrained and prevented from spreading beyond Swiss borders, and while commercial “barter” has been significant and growing steadily, it is still tiny in relation to the totality of economic activity. Virtually all commercial trade exchanges are small, local, and operated as for-profit businesses. Small scale, local control, and independent enterprise are all desirable characteristics, but when it comes to exchanging valuable goods and services, something more is needed. 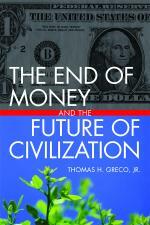 What the world needs now is a means of payment that is locally controlled but globally useful. Members need to offer to the network, not only their slow moving merchandise and luxury services, but their full range of goods and services at their usual prices. This will assure the value of the internal trade credits and make them truly useful. Lines of credit (the overdraft privilege) must be determined according to each member’s ability and willingness to reciprocate, measured for example, by her record of sales into the network. Trade exchanges must be operated for and by the members in a way that is transparent and responsive. As soon as there is a model exchange that has mastered these dimensions of design and operation, its success will inspire others to follow suit and the rapid growth phase will begin, leading eventually to an internet-like global trading network that will make money obsolete. Perhaps Green America Exchange will become that model.